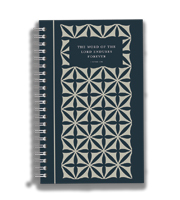 Recognizing the Christian funeral as both a cause to mourn and a reminder to take comfort in the hope of eternal life, we offer supplies to support the Christian funeral service and provide memorial resources that enable friends and loved ones to express their sympathy in a tangible and enduring way. Plain ruled sheets for 22-ring covers. 8-1/2" x 11". Package of 10. Ivory Bemberg with gold & white banding. Latin cross with fleur-dis-lis- ends.